Distinguish between events that are certain, likely, unlikely, and impossible. Understand that probability refers to the likelihood of an event, but does not allow the event to be predicted with certainty. 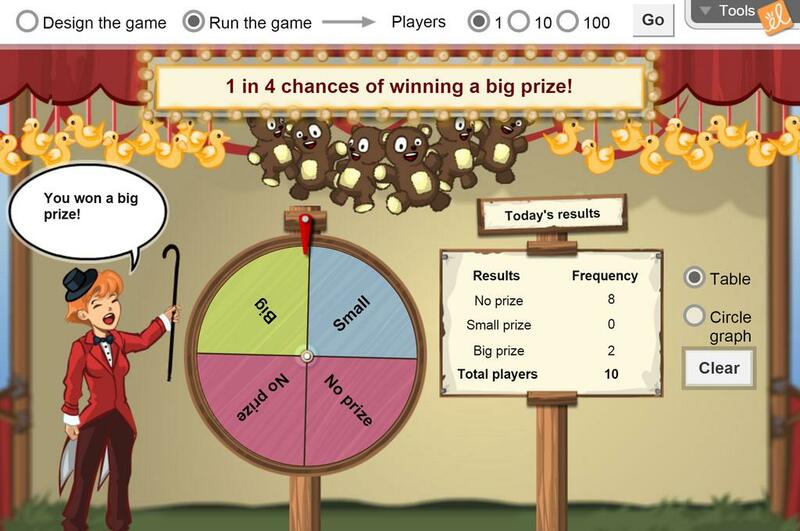 Determine the probability of a given outcome, such as winning a prize with a spinner. Understand that experimental results will not exactly match theoretical probability. This worksheet asks students to review three different days results of data and then infer the design of ... (more)the prize wheel. Students then support the claim with evidence and reasoning. A blank template of the Gizmo's Spin Wheels for offline learning use and assessment. Great for an introduction to probability in Stats class. My kids can see the ideas rather than just hear about them. Great way to connect probability to real-life! Great Gizmo for an introductory lesson. Great for teaching probability. The students love the interactive graphics.